(CNN) - Russia kicked off what it says are its largest war games since the fall of the Soviet Union on Tuesday, as it hosted a bilateral meeting between President Vladimir Putin and Chinese leader Xi Jinping in the far eastern city of Vladivostok. Tuesday's meeting between the two leaders comes amid continued US-led sanctions against Russia and an escalating US-China trade war. At least 300,000 Russian troops, 36,000 vehicles and 1,000 aircraft are taking part in the Vostok 2018 exercises, according to the Russian Ministry of Defense. They'll be joined by thousands of troops from China and Mongolia, which the Chinese Defense Ministry insisted wasn't "directed against any third party" and would focus purely on "defenses, firepower strikes and counterattack." 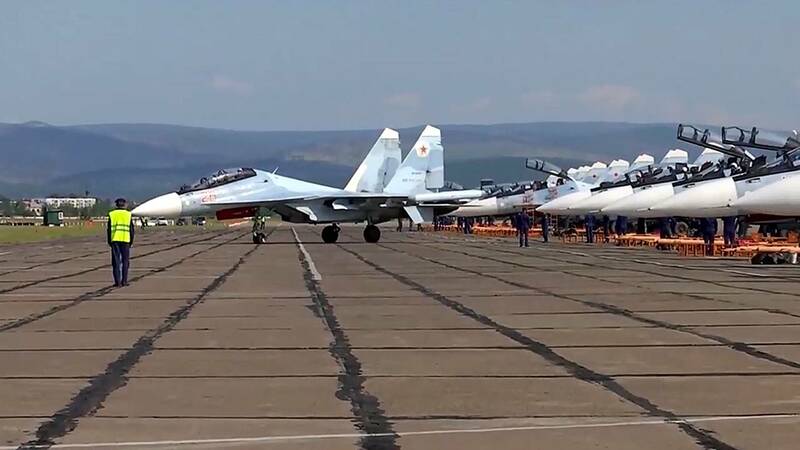 The exercises will be held from September 11 to 17 in Russia's Eastern Military District, an underdeveloped and sparsely populated close to the country's borders with China and Mongolia. In a statement in August, Gen. Sergi Shoigu, supreme commander-in-chief of the Russian armed forces, said the games would be at an "unprecedented scale both in territory and number of troops involved." Putin met with his Chinese counterpart on the sidelines of the event Tuesday, during which Russian state media TASS said "several agreements" would be signed. China and Russia would promote "the political resolution of hotspot issues, resolutely upholding the UN charters and principles and standing firm against unilateralism and protectionism to construct a new type of international relations and a community of shared future for mankind," Xi said in comments Tuesday alongside Putin. Xi's arrival in Vladivostok marked the first time a Chinese leader has participated in the annual event, and the third meeting between Xi and Putin in 2018. Chinese ambassador to Russia Li Hui said relations between the two neighboring countries were at their "best (level) in history," in an interview with Chinese state media Xinhua Monday. Bobo Lo, a China Russia relations expert and author of "A Wary Embrace," told CNN that both Putin and Xi have separate reasons for wanting to amplify their relationship. "(China) is the perfect instrument to project Russia as a resurgent global power, so essentially the Russia narrative is that China, Russia and to a lesser extent India, are part of this new dynamic world order," he said. "(For Beijing) they need Russia to be benign to them, so Russia might not be able to help China that much but Russia can certainly makes things difficult to China if it should ever be so inclined." "Mutual trust between the two countries has reached an unprecedented level and their military ties are closer," Chinese state tabloid Global Times said in an August editorial.